Our education was nationalized. I attended a very good public school. The population was predominantly Catholic, so we had religion in our schools. The day we elected Hitler (March 13, 1938), I walked into my schoolroom to find the crucifix replaced by Hitler’s picture hanging next to a Nazi flag. Our teacher, a very devout woman, stood up and told the class we wouldn’t pray or have religion anymore. Instead, we sang “Deutschland, Deutschland, Uber Alles,” (Germany, Germany, over all) and had physical education. Sunday became National Youth Day with compulsory attendance. Parent were not pleased about the sudden change in curriculum. They were told that if they did not send us, they would receive a stiff letter of warning the first time. The second time they would be fined the equivalent of $300, and the third time they would be subject to jail. The first two hours consisted of political indoctrination. The rest of the day we had sports. As time went along, we loved it. Oh, we had so much fun and got our sports equipment free. We would go home and gleefully tell our parents about the wonderful time we had. When the mothers had to go out into the work force, the government immediately established child care centers. You could take your children ages four weeks to school age and leave them there around-the-clock, seven days a week, under the total care of the government. The state raised a whole generation of children. There were no motherly women to take care of the children, just people highly trained in child psychology. By this time, no one talked about equal rights. We knew we had been had. In 1944, I was a student teacher in a small village in the Alps. The villagers were surrounded by mountain passes which, in the winter, were closed off with snow, causing people to be isolated. So people intermarried and offspring were sometimes retarded. When I arrived, I was told there were 15 mentally retarded adults, but they were all useful and did good manual work. I knew one, named Vincent, very well. He was a janitor of the school. One day I looked out the window and saw Vincent and others getting into a van. I asked my superior where they were going. She said to an institution where the State Health Department would teach them a trade, and to read and write. The families were required to sign papers with a little clause that they could not visit for 6 months. They were told visits would interfere with the program and might cause homesickness. As time passed, letters started to dribble back saying these people died a natural, merciful death. The villagers were not fooled. We suspected what was happening. Those people left in excellent physical health and all died within 6 months. We called this euthanasia. Next came gun registration. People were getting injured by guns. Hitler said that the real way to catch criminals (we still had a few) was by matching serial numbers on guns. Most citizens were law abiding and dutifully marched to the police station to register their firearms. Not long afterward, the police said that it was best for everyone to turn in their guns. The authorities already knew who had them, so it was futile not to comply voluntarily. 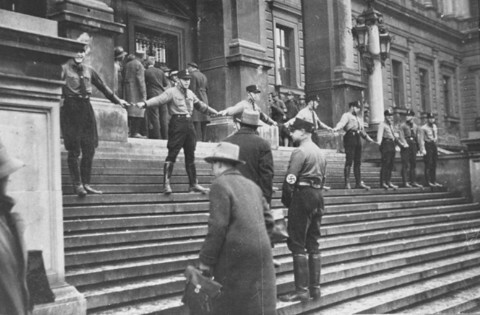 Totalitarianism didn’t come quickly, it took five years from 1938 until 1943, to realize full dictatorship in Austria. Had it happened overnight, my countrymen would have fought to the last breath. Instead, we had creeping gradualism. Now, our only weapons were broom handles. The whole idea sounds almost unbelievable that the state, little by little eroded our freedom. After World War II, Russian troops occupied Austria. Women were raped, preteen to elderly. The press never wrote about this either. When the Soviets left in 1955, they took everything that they could, dismantling whole factories in the process. They sawed down whole orchards of fruit, and what they couldn’t destroy, they burned. We called it The Burned Earth. Most of the population barricaded themselves in their houses. Women hid in their cellars for six weeks as the troops mobilized. Those who couldn’t, paid the price. There is a monument in Vienna today, dedicated to those women who were massacred by the Russians. This is an eye witness account.